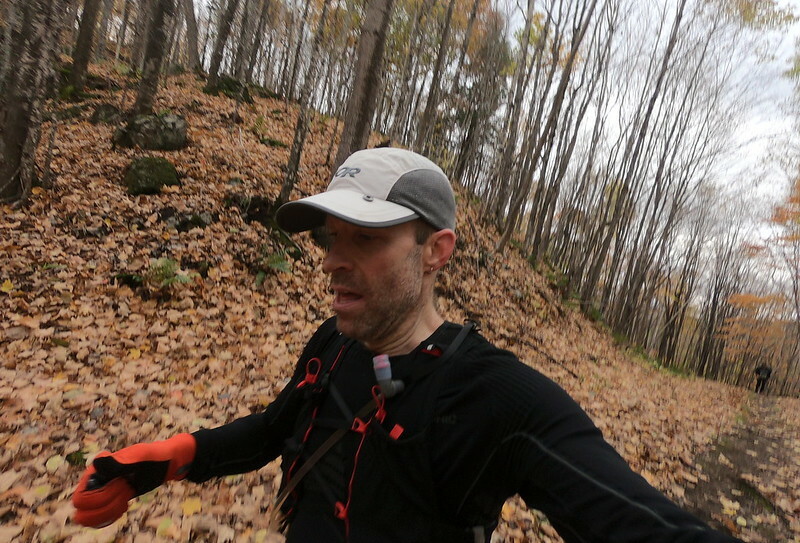 Much like last years race, my decision to take part in the Mad Trapper Relentless 50k race came very much at the last possible moment. 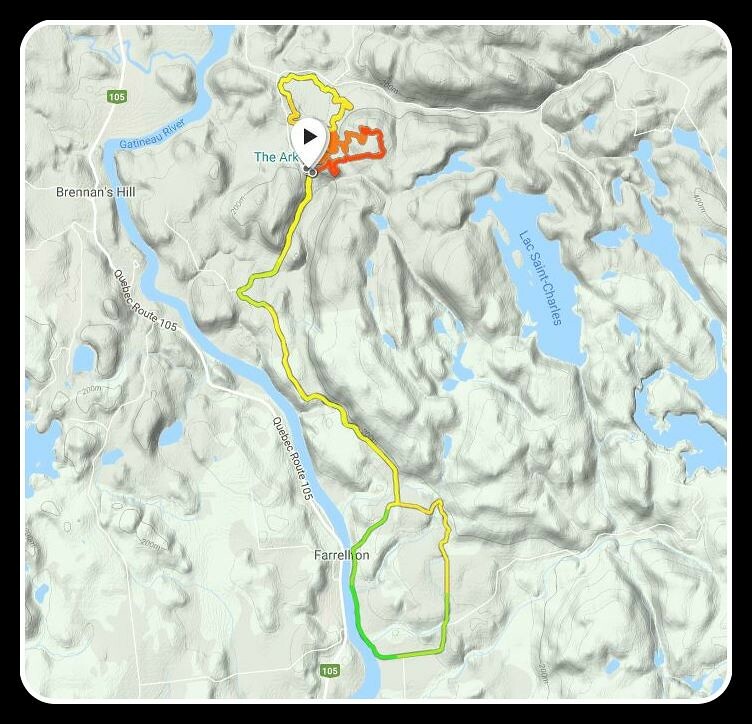 In fact, I registered for the 50k race on the Tuesday evening, with the event taking place bright and early on Saturday morning. Also like last year, I had opted to see how I felt this late in my race season before committing. 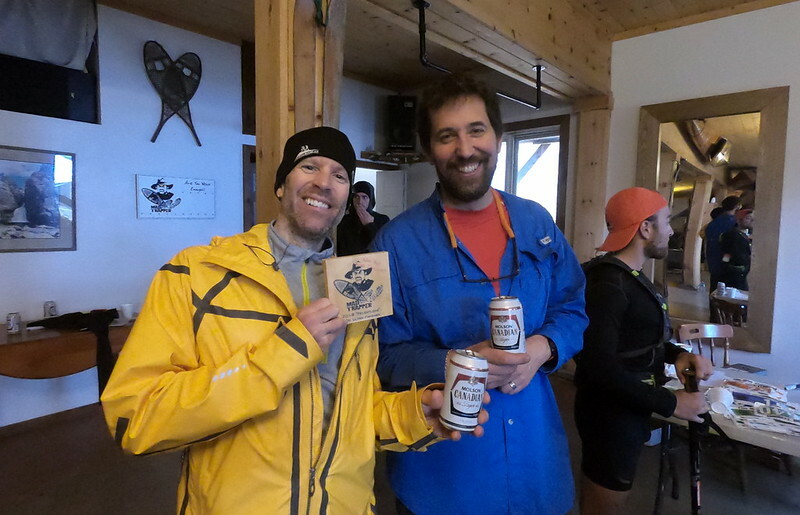 3 weeks prior, I’d had a very good run at the 24 hour Wilderness Traverse Race, finishing 1st in category, 4th overall. Recovery from that was fast, and my feet were itching at the chance to race one final ultra before what would likely become a longer period of rest and recovery following surgery (and indeed the very real risk that I may not return to top form if anything went sideways!). With all this in mind, I went in with eyes wide open, good course knowledge, and high hopes for reaching the top step of the podium once again. You see, last year, I literally ran away with 1st place overall, and no one even really challenging (it was almost 1.5 hours until 2nd place finished!). I’d lead from the start to the finish of that event. Mind you, it was a very small field, with no ‘hot shots’ at the start (including me of course). 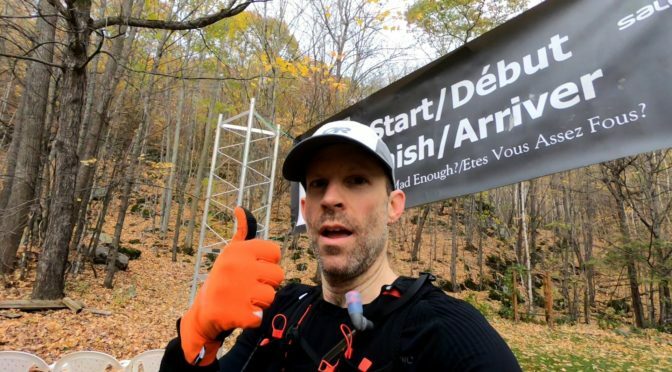 This year, there was a slightly larger starting field, which included some REAL heavyweights, including top track runners and accomplished ultra runners. There would be no gifts in 2018! As I glanced around, I figured my chances were pretty low at a repeat win. Guy Doiron, whom I’ve lost to on more than one occasion in ultras was toeing the line. Also, speedy dudes like MacKenzie Palmer and Navid La Bomba were trying their luck. Luckily, they had less ultra-distance races under their belts, so I hoped that experience would win the day. Others I didn’t know, but were friends of Guy’s and were likely good runners. Oh well, I was in it for fun, not victory. I’d drink the same finish line beer and eat the same burgers and brownies as everyone else would, regardless the outcome. There are 50k, 21k, 10k, 5k, and even 3k events, with most events starting out later in the day. 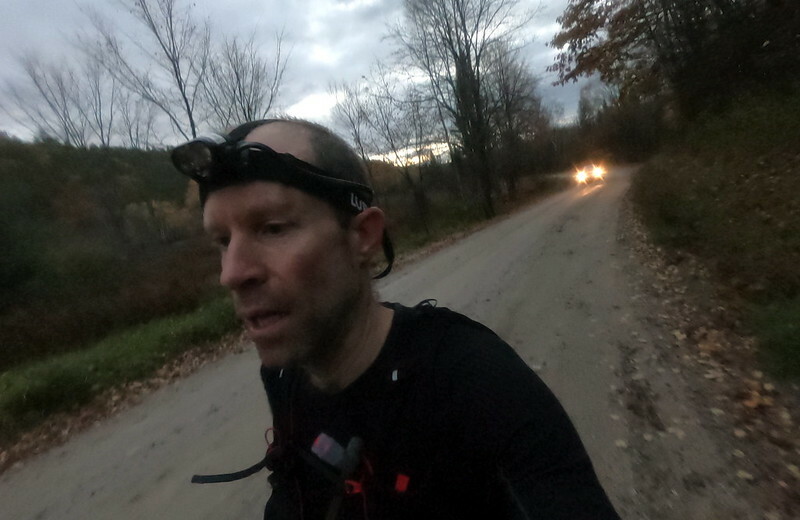 We got underway under the cover of darkness, and started our race with an 18k gravel prologue along a country road loop around the Ark, after which we got to complete 3 grueling laps of the 10k singletrack course. As with last year, the start was extremely low key, with Mike telling us we could start running at one point after we all gathered on the road. However, the pace was anything but pedestrian at the start. The entire field seemed to surge and break into probably 10k road pace. After the first 200m or so, I was already yelling out ‘what’s your hurry?’ to the rapidly disappearing group. By the first road intersection, where Mike had caught up to us in his truck to place markers further on the course, I was already pretty much dead last (or possibly even last). While competitive me might have been a bit despondent, experienced me recognized things for what they were: people were running WAY TOO FAST on the roads. They’d pay. I was sure of it. Ultimately, I always prefer chasing from the back than leading at the front. I need the targets to chase, and decide whether I have the energy to challenge or just let things go and have fun. 2017 was one of the very few races where I actually lead the pack. It was WEIRD to me. At any rate, as the kilometers were ground up under my Hokas on the gravel roads, I eventually starting reeling a few people in, taking maximum advantage of any downhill stretches where I’d go flat out and allow gravity to carry me forward. By the time we arrived back at the Ark to start the Relentless loops, I think I’d moved back into almost mid-pack. This of course was where my real game plan came into effect. Past experience at the Ark (which after over a decade is pretty deep) has taught me that a lot of people underestimate the terrain out there, and slow down a fair bit in the trails. On the other hand, I know pretty much every twist, turn and root, and know where to push and where to hold back. At the transition zone, I grabbed / refilled my hydration and nutrition and started the first loop. While there is technically an aid station about half way through the loops, I prefer to run the whole 10k, then grab what I needed from my own personal stash at the start/finish. It’s just more efficient for me, and is the perfect length of time to go with 1 bottle and 1 or 2 energy snacks. 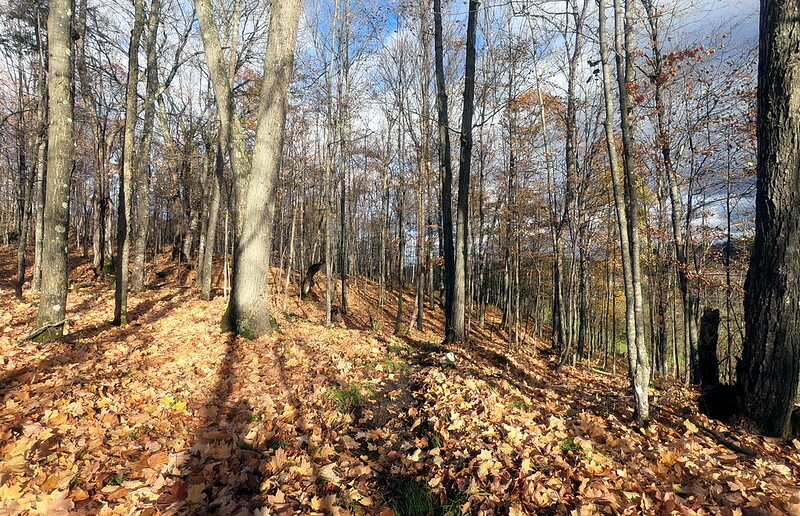 As I started up the first of the many short steep climbs on the loop, I could see the front runners coming back around on another part of the trail. They were FLYING, and it was Navid and MacKenzie leading, with Guy right on their heels. In my mind, I still pegged Guy as the eventual winner, and only staying with them to keep tabs on them. I was SURE they were going too fast for a 50k. At this point, I was about 1.1km behind already. But no panic on my part. Hold the pace, keep the energy and play the odds. I instead focused on not injuring myself. In fact, since I wasn’t sure about the front of the race, I’d say I was going slower than I could have, being careful with my footing. As the kilometers started ticking by I was most definitely starting to claw my way back. 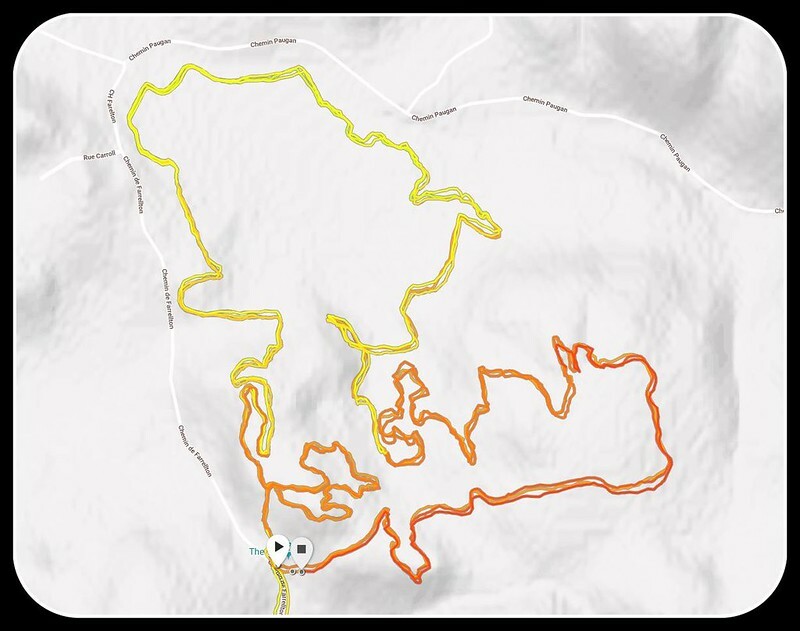 The way the course was laid out, there were a number of opportunities where you could see how far you were from the next runner, due mainly to the hills and all the twists and turns of the course. The only challenge was that you couldn’t be certain whether the person was 50m ahead or 200m ahead! Regardless, it was useful in order to at least give you something to chase if you were so inclined, and you might also, if you were lucky, be close enough to gauge somewhat whether or not the person was suffering or fading. For my part, I do my best to always look fresh and energetic, otherwise, the wolves will smell the blood and hunt harder! 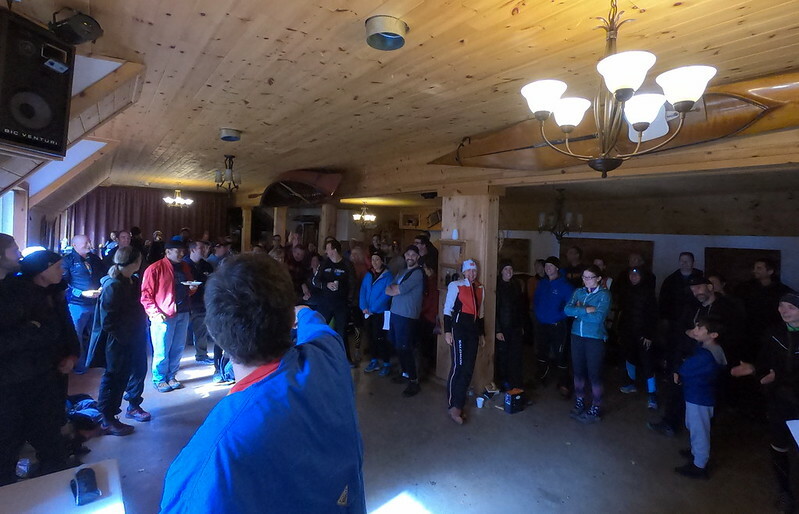 Due to the staggered start of the other races, one of the things I tried to keep top of my mind was when the next ‘wave’ of runners would be getting on the course. My goal was to make sure I would start my next lap BEFORE the start of the next event. I for one would much rather have people chase me down and pass me than to come across and need to pass a mass of runners in another race. Sounds like a small thing, but you can waste a lot of energy being trapped behind slower runners, and are often risking an injury by trying to pull off a tricky pass on singletrack trail. This strategy worked well for getting onto the second loop well before the 21k race got underway. I was also going to use this as an opportunity to gauge my race from this year compared to last year. I remembered clearly where I was passed by the front runners last year, and I got a lot further this year before Dave McMahon came puffing behind me and trotting by. However, it seemed that he wasn’t being pushed as hard as he was last year by some other hot-shots. So perhaps all the big names were racing elsewhere this time? Either way, I was happy with how I was running my race and took the chance to chat briefly with Dave before letting him gap me. By this point in the race, I had definitely made my way through a good chunk of the 50k field, but was not clear exactly where I sat. My guess was somewhere in the top 5 by now. Once I was nearly onto lap 3, I carefully let myself push just a little more to see what would happen. I’d kept well hydrated and had my snacks along the way, so the energy levels were solid (thanks to Fruit2, Tailwind and NUUN!). Lap 3 was definitely and interesting one, as I came across some struggling runners like Navid and MacKenzie! They had both blown up and by my estimation were no longer a challenge. I was a bit surprised. MacKenzie at the end of lap 2 in particular looked to be in rough shape, with a fine covering of salt on his face. He hadn’t ate or drank to that point, and was suffering badly. I gave him some advice and kept on pushing. Knowing that I’d passed the 1st and 2nd place runners gave me some hope that I was now in contention for a podium spot. The chase was on now and I was hoping to catch a glimpse of Guy somewhere in the twists and turns, but it was never to be. He was a ghost in the wind. Feeling good, I pushed on. At this point, I was regularly passing other runners, but they were a mix of people either a lap behind in the 50k, or on their 2nd lap of the 21k course, or even in some cases 5 and 10k runners, so I was no longer sure if I was actually gaining on anyone. I put my faith in my feet all the way to the finish line, knowing this was my last race of the season. Crossing the line, I could see Guy for sure had finished (looking relaxed), but there didn’t seem to be anyone else hovering that had started the 50k. Within a few minutes I pieced together the fact that I managed to snag the 2nd place spot!! Given my competition, I was quite happy with that result.